Light and warm jacket in a woollen look. Colour: anthracite. 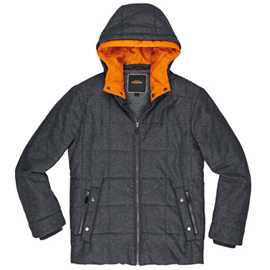 80% wool, 20% viscose, orange hood lining made of 100% polyester. Inner collar and jacket lining made of fleece, hood lining can be removed with a zip and press studs, air trap on the sleeves, side pocket with zip, pockets with zip tags, document pocket, mobile phone pocket with velcro, metal badge with STIHL Timbersports embossed on the left sleeve. Sizes: XS, S, M, L, XL, XXL.